Hello my lovely readers!! 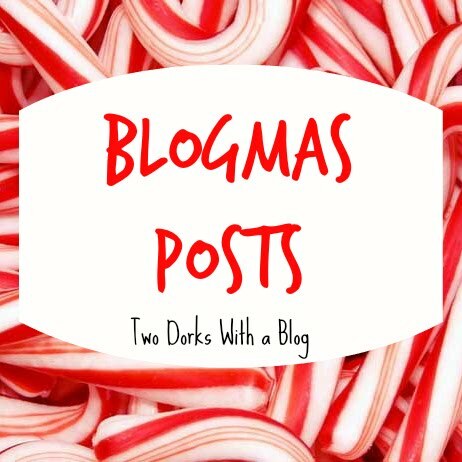 I have come to grace you with another blog post. 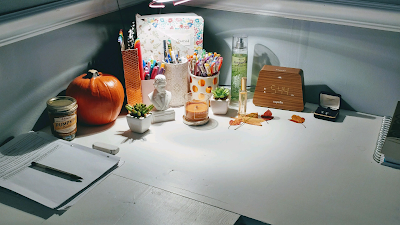 It's fall and I've been feeling very cozy lately. Watching people's nighttime routines always makes me feel even more cozy so I am sharing mine with you. Lets get started! I know this may seem early for many people, but honestly I have a somewhat old soul/brain. I go to sleep at 9:30 and 5:45 is generally the time of day I either start relaxing for the night or I go to a friends house. So I'm either chilling out, or going crazy having fun with friends: one or the other, there is no in-between. So after I eat dinner and clean up my desk, I get in the shower. 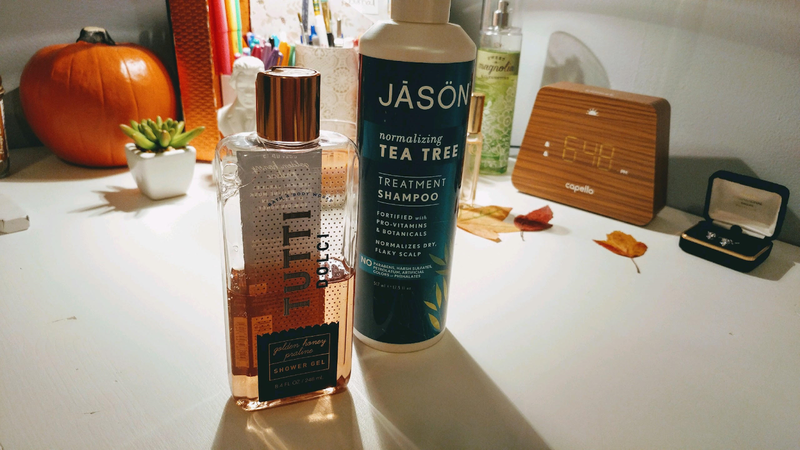 I have been loving the JASON Normalizing Tea Tree shampoo. It helps regulate dandruff and itch which I love. Whenever I rinse my hair I feel like I have mermaid hair, but I've talked about the shampoo a few times before. My body wash is Tutti Dolci Golden Honey Praline from Bath and Body Works. I got it right around Independence Day when they had a big sale, so it was three dollars for a full size and I was like, "Yes please!!" 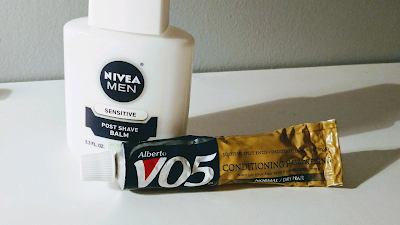 After I get out of the shower I slather some of NIVEA's Post Shave Balm on my legs. Yes it is a men's product, no I'm not a freak, yes it works soo well. I don't have any poke-y hairs and it's been 2 days since I shaved. Plus it moisturizes and helps keep my skin looking vibrant and not pale like are in the fall/winter. I also put a little Alberto VO5 Conditioning Hairdressing gel in my hair. Guess what. This is a men's product to. But really it's not like it does anything special for men's hair that a girl wouldn't want. It helps prevent frizz, add shine, and makes your natural highlights stand out. I don't know if anyone has noticed, but I've seen an extra vibrancy to my hair and the red-ish highlights are standing out so much in the right light. After this I put on some comfy clothes. This sweater is a pinky/beige sweater I got at Sears, but it's by Simply Styled. I love this brand, all their clothes are so soft and comfy. I also put on my floral drop shorts. 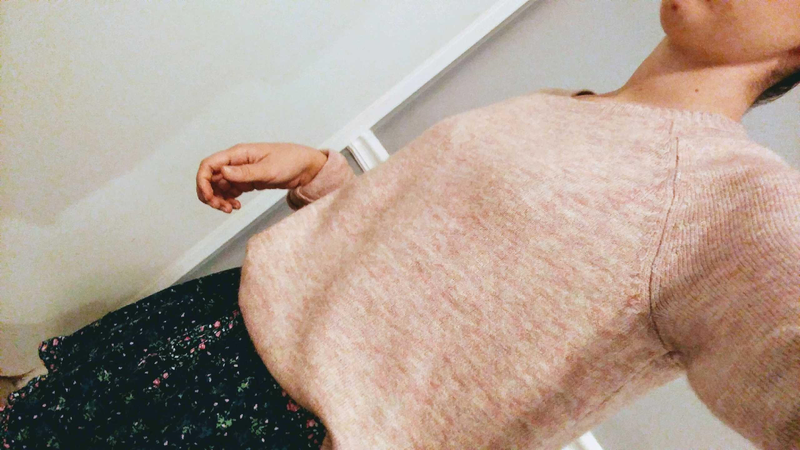 I know you wouldn't normally wear a sweater with shorts but it is super comfy and sometimes long sleeves AND pants make me a little sweaty. 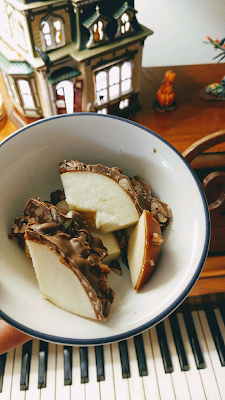 Mom just got back from the grocery store and she brought home a caramel-chocolate-pecan caramel apple so I had to have some of that. Let me tell you: this was the best thing I have EVER tried. You all should eat them, or make them or whatever. Just get your hands on them somehow! Now. If you were here about a year ago, you will remember my obsession with all things Department 56. And if you were keen, you will notice above the picture of my chocolate-caramel-apple-pecan-delicious-diabetes-ness had a Department 56 house in the background. If you are KEEN (capital letters KEEN) you will notice that it had lights inside of it. You will then remember that I could not put lights in the Dept. 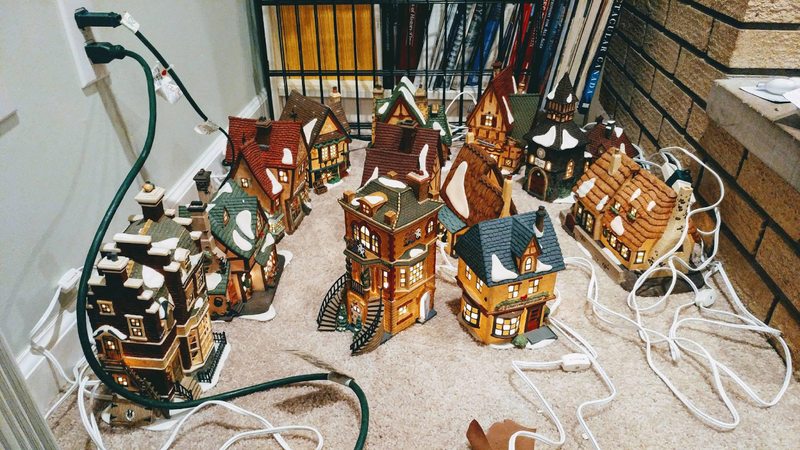 56 houses last year. Well I figured it out this time. That got me a little excited. So my project tonight was to make sure all the Christmas lightbulbs worked. 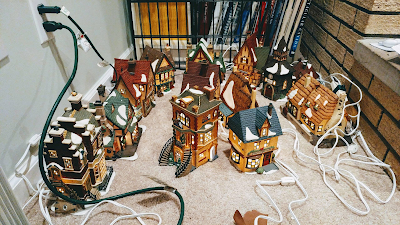 I pulled all twelve houses out. By now it was about 9pm so it was time for me to get ready to go to bed. I headed into the bathroom to wash my face. 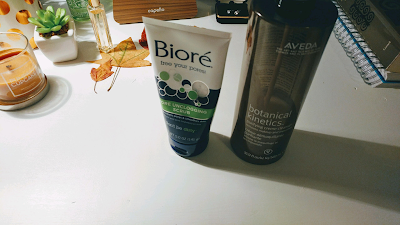 I have been using Biore's Pore Unclogging Scrub to gently exfoliate my face. I can't even describe why I love this so much. But give me time because it will be in my favorites. My skin is always soooo soft I literally feel like a baby. Then I cleanse with AVEDA's Botanical Kinetics Purifying Cleansing Crème. I've already said a lot about my cleanser so I won't say much about that. So then I just get into my jammies and cozy in bed with a good book until I fall asleep. I really hope you enjoyed this post because I had so much fun writing it!!! Leave a comment down below telling me what your favorite fall snack is! !